AADHum brings together the fields of African American studies and digital humanities in order to expand upon both fields, making the digital humanities more inclusive of African American history and culture and enriching African American studies research with new methods, archives and tools. Generously funded by The Andrew W. Mellon Foundation, the initiative draws on the remarkable faculty, staff and centers in the College of Arts and Humanities and across the university with internationally recognized expertise in the digital humanities and in African American literature, history and culture. Co-directed by the Maryland Institute for Technology in the Humanities and the Arts and Humanities Center for Synergy, our archiving efforts focus on themes of African-American migration, artistic expression and labor in collaboration with the Center for Global Migration Studies, David C. Driskell Center and the University Libraries’ recently acquired George Meany Memorial AFL-CIO Archive. To further Connect, Learn, Engage, and Collaborate with the Initiative please visit us at AADHum.umd.edu. Stay updated on our latest news and events by following us on twitter @UMD_AADHum. The Maryland Institute for Technology in the Humanities (MITH) and the Andrew W. Mellon-funded African American Digital Humanities Initiative (AADHum) invite your participation in “Textual Embodiments,” the Society for Textual Scholarship’s International Interdisciplinary Conference for 2017. 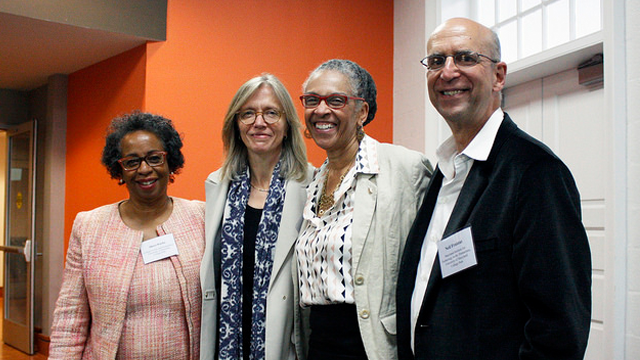 See photos from the launch event for the AADHum initiative.